Bill O’Reilly Claims Enslaved Africans Who Built White House Were “Well Fed”; Dyson & Glaude Respond | Democracy Now! 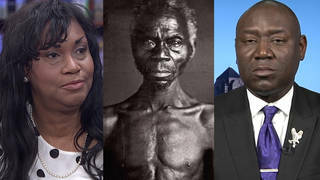 Fox News’s Bill O’Reilly has sparked widespread condemnation over his comments that enslaved Africans who built the White House were “well fed.” He made the comments on Tuesday, after first lady Michelle Obama spoke at the DNC on Monday about “wak[ing] up every morning in a house that was built by slaves.” We get reaction from Princeton University professor Eddie Glaude and Georgetown University professor Michael Eric Dyson. AMY GOODMAN: This is Democracy Now!, democracynow.org, our two weeks of specials from the Democratic and Republican conventions, “Breaking with Convention: War, Peace and the Presidency.” I’m Amy Goodman. We’re broadcasting this week from Philadelphia, the Democratic National Convention. In a minute, we’re going to return to the debate with Georgetown professor Michael Eric Dyson and Princeton University professor Eddie Glaude. But first I want to turn to first lady Michelle Obama’s address to the DNC Monday night. MICHELLE OBAMA: I wake up every morning in a house that was built by slaves, and I watch my daughters, two beautiful, intelligent black young women, playing with their dogs on the White House lawn. AMY GOODMAN: So, that’s first lady Michelle Obama speaking Monday night here in Philadelphia. Well, Fox News’s Bill O’Reilly responded to Michelle Obama’s comments on Tuesday by claiming the slaves who built the White House were well fed. BILL O’REILLY: Slaves that worked there were well fed and had decent lodgings provided by the government, which stopped hiring slave labor in 1802. However, the feds did not forbid subcontractors from using slave labor. So Michelle Obama is essentially correct in citing slaves as builders of the White House, but there were others working, as well. AMY GOODMAN: That was Fox’s Bill O’Reilly. Again, our guests, Georgetown professor Michael Eric Dyson and Princeton professor Eddie Glaude. Your response to that, Michael? MICHAEL ERIC DYSON: Well, it’s, Mike Tyson might say, ludicrous for Bill O’Reilly to deny the fact that slave labor built that institution—in fact, built America, Toni Morrison said, on the backs of blacks. We have erected American society. Democratic projects, institutions and energies all rest on what black people provided, and not just physical labor, whether Benjamin Banneker drafted the plans and extended what had begun with another architect, or the fact that black intellectual and social and moral vision made possible the realization of the very democratic energy that that building embodies and represents, the point that Professor Glaude was making earlier, in terms of taking a brief tour of what black people have done in this country. That White House represents such a powerful moment, a locus of such competing energies. And the reason Bill O’Reilly is upset and many white people are responding is because Michelle Obama, without saying so, without saying, “I’m engaging in a powerful articulation of blackness in reaction to the rise of white supremacy and a culture that adores whiteness as the norm for America,” she was invading that. Her black body invades that. Her talking about her children on the White House lawn is messing with the mindset of these bigots out here who are looking, in the broader scope of things, at just how lethal the presence of Obama and Mrs. Obama and their children represent, beyond any of the politics. MICHAEL ERIC DYSON: Yeah, what he said. EDDIE GLAUDE: I mean, it’s just stupid. But it’s revealing in its stupidity, because part of what’s at the heart of the problem in our discussions around race in this country is a fundamental bad faith—right?—that there is a sense in which the ways in which folks engage in the conversation around racial inequality, the beliefs and assumptions—right?—that inform that conversation are never made explicit. And so, people are always evading, sticking their heads in the sand like ostriches, or trying to find—right?—another account of what’s going on. So it’s stupid, and it’s bad—so it’s revealing in its bad faith. But let me say this about Michelle Obama. It was a powerful speech. But what was so disturbing to me is the way in which the Democratic Party has traded in a kind of insidious American exceptionalism. So, at that moment in which we talk about our beautiful black—my beautiful, intelligent black daughters playing on the lawn of the White House, I understand the symbolic significance of that, but that was deployed in the context of a narrative of America being the greatest country on the planet, the greatest country. I mean, they were, in some ways, replaying, retooling Ronald Reagan’s morning in America, the shining city on the hill, Reagan’s revision of John Winthrop’s, you know, model of Christian charity, right? And so, what do you get? You even get Joe Biden last night talking about the 21st century will be the American century. I almost—I threw my house shoe at the television. Right? Then all this talk about we’re the greatest country, we have the greatest military—that looked like the Republican Party of the 1980s. No wonder Melania Trump could plagiarize Michelle Obama, because it fits perfectly. MICHAEL ERIC DYSON: —sui generis a response of America. But I’m saying to you, the bigots ain’t got no—made no mistake about what Michelle Obama was saying. We might engage in a kind of philosophical argument about what is going on there, but the bottom line is, they got the message real loud and clear. And it wasn’t about the articulation of American exceptionalism, which I agree should be criticized, or the degree to which Barack Obama is like the other Negroes. What Michelle Obama was saying, “I’m just like the other Negroes.” She’s presenting a counternarrative to the hegemony of American exceptionalism by saying the slaves who built that are manifest in their ancestry to the noble lineage that my children represent. So she’s connecting and suturing what has been severed. AMY GOODMAN: We only have two minutes left. What about Supreme Court justice choices in the next, either, whoever it will be, presidency? EDDIE GLAUDE: Well, this is—this is critical. This is critical. In some ways, this is part of why I have a dual strategy, really quickly. Right? This is why I say we have to keep Donald Trump out of office, and we have to announce that- business as usual is unacceptable. And we have to begin to shift the center of gravity—right?—of Democratic politics in black communities, right? Part of the thing that I want to suggest—so, I’m conceding your point about the importance of the Supreme Court, and this is why we have to engage in this dual strategy, right? But what’s ultimately at the heart of my understanding here is that we have to understand the rot that’s at the heart of this country. And that is, our current way of living is no longer sustainable, and that the crisis in black communities require a different kind of politics. The black political class has become identical, indecipherable from the Democratic establishment, right? And that—to that extent, people can trade in identity politics, can talk about race and gender and all this stuff, when we know that that’s the currency of neoliberalism. EDDIE GLAUDE: But part of what I want to suggest is that we need a radical reimagining of the Democratic politic. AMY GOODMAN: Michael Eric Dyson? MICHAEL ERIC DYSON: Beyond a radical reimagination—I’m down with all that stuff that Eddie said—at the end of the day, I’m with her, he’s with me, we with us. What I’m telling you is that the decision to be made is that we’ve got to keep from getting into office a demagogue who would change the landscape not only of American representational and democratic politics, but the very nature and fabric of the conversation’s possibility, the conditions of emergence. So, I’m saying to you, at the end of the day, Hillary Clinton has to be put into office, because the Supreme Court justices will make a difference, the way in which the landscape of policy recommendations will make a difference, the presence of a person who is open to challenging white supremacy, white hegemony, white dominance and white privilege through her own rhetoric. And if she means it or not is irrelevant, because we can take that rhetoric and do with it what we will. AMY GOODMAN: We’re going to have to leave it there. I want to thank you both for being with us. I want to thank Michael Eric Dyson for being with us. Michael Eric Dyson is a professor at Georgetown University, author of many books, including The Black Presidency: Barack Obama and the Politics of Race in America, and Professor Eddie Glaude, who teaches at Princeton University, head of the Department of African American Studies. His most recent book, Democracy in Black: How Race Still Enslaves the American Soul. That does it for our show. I’ll be doing a report back from the conventions at two talks: Friday, July 29th, in Provincetown Town Hall in Massachusetts, and Saturday in Martha’s Vineyard Old Whaling Church. Check our website, democracynow.org. Happy birthday to Rob Young. Special thanks to Laura Deutch, Gretjen Clausing, Ryan Saunders. I’m Amy Goodman. This is Democracy Now!, broadcasting from the Democratic convention. Thanks for joining us.